There’s no denying that the new season beauty collections are tempting, with their moody, mysterious ways. But autumn and winter will be long enough once they get here, so let’s make the most of our summer brights while the sun still shines. And brights don’t come better than Maybelline’s latest offerings: super saturated and eye-poppingly bold, these new Master Chromatic eyeliners and Colossal Colour Shock mascaras are fabulous and fun. Not to mention how awesome they look with a tan. The mascaras, in Electric Blue or Electric Teal, are a brilliant budget pick for anyone who was lusting after Chanel’s gorgeous summer offerings, but couldn’t justify the spend. The collagen enriched formula gives volume and length and the colour payoff is brilliant – especially for €10.75. For me, though, the eyeliners steal the show. Comparable to the much-loved SuperShock liners from Avon (sadly no longer available in Ireland), these have the most delightfully soft and creamy formula, gliding smoothly on to the eye. You won’t get a clean, graphic line here, but they’re the bomb for a softly smudged and lived-in eye, with a slightly rock’n’roll type of vibe. In a word, they’re gorgeous – and they’re just €6.99. Shades include Magic Magenta, Purple Light, Vibrant Gold and Turquoise Vibe – I’d wear ‘em all, but the pink’s the trickiest to carry off, unless you have a darker skintone. My thoughts are turning to holidays – mine being just a few short weeks away – and these are the perfect holiday fling. What do you think, are you liking, or are you already in an autumnal frame of mind? I like all these bright colours. Very glamorous. I don't know which is worse, sweating like crazy during Summer or shivering in Autumn-Winter :D I'm still on a Summer vibe though. Great fun colours, but for me this range is too late for summer...I've already moved on!! Love the mascara on you!! The teal is gorgeous and the pigmentation is great! The Turquoise liner is gorgeous on you & I really want it. Vibrant mascaras and eyeliners - I say yes! Oh wow, love the look of these!! I love the super shock pencils so will definitely give these a go too. The mascaras look fab too! I love those eyeliners! The colors are absolutely gorgeous. Beautiful look!!! I love this colors!!! Emma, love what you have done with these! Me wanty! I like the look of the purple and gold eyeliners.... Very pretty! Need Turquoise & Purple! Also... I wonder if you could use the pink on your lips instead...??? Wow, those pencils are so pretty! This is such a fun trend for Summer, but my heart is with Autumn already...I'm getting ready to whip out my dark lippies! Also the teal mascara looks so cute on you! These look so pretty! I really wanna give them a try! 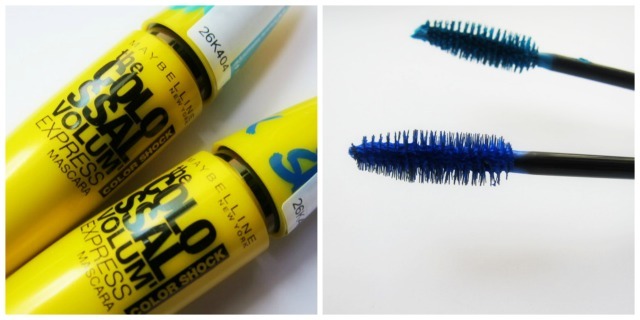 I need that electric blue mascara! Not a huge of the blue mascara, but I have been eagerly awaiting pay day to try the liners. I can't wait to play with them. They look so vibrant in your pics.